BarCamp goes all American. This was the motto of the 14th edition of Barcamp Prishtina, held during the 6th of July with special guests from the United States of America. 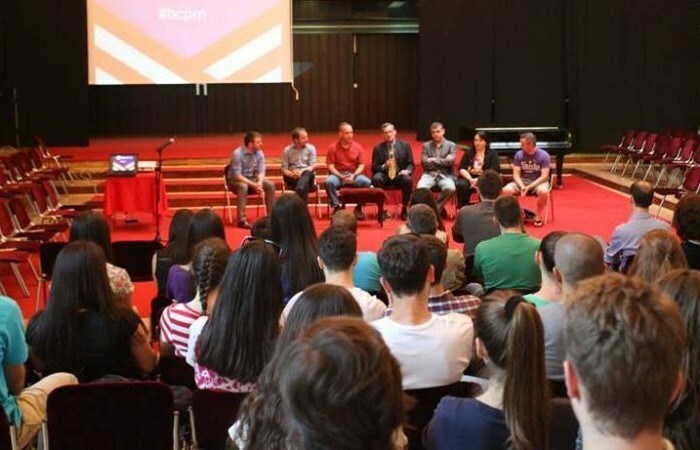 Organized in a more formal way, thus celebrating a bit of 4th of July, the 14th edition of BCPR was held in the Red Hall of Youth Palace. Ambassador Akan Ismali, Christian Renaud, General Timothy Orr and special guests from Iowa sister state were guests of this BrCamp edition. A lot of discussion arose when some of 80 people who were present in the audience started to share opinions and asked interesting questions from time to time, thus making the event more interactive during the two hours of fun. The Ambassador of Kosovo to the United States, Akan Ismaili, co-founder and ex-CEO of IPKO shared some interesting details about his early involvement with the Internet Project Kosovo and the challenges faced after the war in Kosovo, focusing on businesses cases and negotiations with international investors that went through during that time. Christian Renaud, director and mentor at Startup City Des Moines and senior researcher at 451 Research in New York, in typical entrepreneurial approach talked about his experience in working with the startup community in the state of Iowa where not so much was going on, and where he is still involved with a business incubator supporting new startups through mentorship and a network of business angels. BarCamp Prishtina had also a guest from the US Army, whereas General Brigadier Timothy (Tim) Orr gave details on how the military community is organized in the state of Iowa, serving full time in the state duties and working on farms and other business related tasks after the daily commitments. General Orr was not for the first time in Kosovo, since he is also involved with projects going on together with the Kosovo Security Force, which is being supported by the State of Iowa.. He emphasized that more needs to be done in promoting and exporting local products from Kosovo, while he expressed his positive impression in what he saw. Representatives of Iowa Sister cities were also present, focusing their talk more on voluntary acts and their future involvement with projects in Kosovo and the volunteers here.